As we continue to showcase the noteworthy, the remarkable, the powerful, the inspirational and the just down-right outstanding individuals that made us all fall in love with swimming, biking and running even more than we already did, the next category in the series is…. Most Inspirational. The 2018 men’s race at the first ever WTS Bermuda was the event the triathlon world didn’t even know they were waiting for. Through the swim and the first stages of the bike, the field had merged into one giant pack. However, the beast of Corkscrew Hill provided the perfect opportunity for someone to push on and break away, and it was the young Norwegian Casper Stornes who accepted that challenge. Going out ahead he rode for almost 30 kilometres by himself and began the run still on his solo mission, ultimately taking the tape at 1:54:47. What he didn’t know was that although they were too far behind to catch up to Stornes on the bike, Norwegian compatriots Kristian Blummenfelt and Gustav Iden had also seized their moment to create a gap heading into the second transition. From there, it was just a case of holding on to the magic. 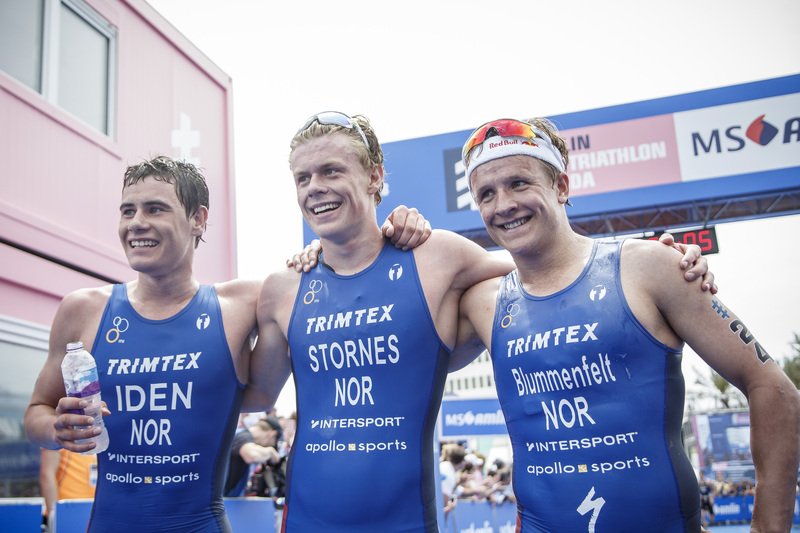 Blummenfelt crossed the finish line 21 seconds behind Stornes to claim the silver and the saga continued as Iden followed closely behind, the three training partners and national teammates embracing as they became the first nation ever to sweep a men’s WTS podium, Stornes and Iden also celebrating their very first WTS medals. Triathlon may be known as an individual endurance sport at its core, but it is moments like the one in Bermuda that inspire collective encouragement, motivation and, ultimately, success. Lauren Parker was always an aspirational triathlete who trained to win and achieve her dreams. Among them was to one day win the Ironman World Championships in Kona and, until April 2017, she was well on her way to realising it. A regular training day on the bike turned horribly wrong, however, when she crashed out and was severely injured to the point of paralysis from the waist down. While for many, having to endure such a traumatic accident might deter them from ever daring to dream again, Parker is simply not one of those people. The Australian re-entered the world of triathlon as an Elite Paratriathlete, working so hard that, just a year after her accident, she won bronze at the 2018 Commonwealth Games on the Gold Coast. She then went on to finish third at the 2018 Paratriathlon World Championships on the same course five months later, proving that you really can take a seemingly impossible situation and overcome the biggest of obstacles. Lauren Parker is the very definition of inspirational. South African Mhlengi Gwala was going out for an early morning training session when a horrific incident left him with devastating leg injuries. After extensive treatment in hospital, Gwala can not only now walk again, but is training hard and has his sights set on competing in 2019!